It is hard to believe that you had brought home a bundle of joy that was so little and helpless. Your 9-month-old baby is now an individual in their own right. You will see your baby’s personality and strong choices, which will make every moment more fun and joyous for you. Your 9-month baby will be crawling with great confidence now. Your baby will be constantly on the move, trying to grab whatever they can, to explore and understand it. Some babies are able to push themselves up a step or two, so if you have stairs at home, you need to supervise your baby at all times. You will notice that your baby enjoys movements, sitting up and crawling, or lying down at will. Your baby will change positions according to the mood, like when there is a tantrum coming on. Some 9-month-old babies can even start to pull themselves up to a standing position by holding onto a table or sofa edge. Be careful as objects like chairs, which can easily be moved, might lead to a fall. This is a natural part of your baby’s development though, and how they learn physical boundaries. You can allow him to experience his surroundings while keeping an eye on him. Your baby is feeling the surroundings and developing. Your baby is feeling the feet gripping the floor, and the hands are finding ways to coordinate picking up and holding onto toys and other objects. You will see that your 9-month baby will move things from one hand to another, and even try to fit them into crevices and spaces. Just make sure you keep sharp or harmful things out of reach, as your baby will definitely put some of what can be held into the mouth. Your baby is developing at a rapid pace. In the first year, your baby is picking up most of the skills and tools for the future. The brain is developing and learning quickly, so any stimulation you provide will help. Reading, music, and talking to your baby is extremely helpful. You may find it hard to believe but your baby understands what you say, not by words but by subtle cues. This helps your baby associate it with words and leads to the understanding of language. Your baby will even respond to you, although most of it will be incoherent, as speech is still developing. You may observe that you understand some of the sounds your baby makes regularly, as you are the one who hears them the most. Your baby will understand you better and know when you are angry, for example, and when you are happy. Positive reinforcement will teach your baby to repeat the action, which is how they learn right from wrong. You will notice that your baby is a lot more anxious when you are not around. Your bond with your baby is security, and any situation that is different will be a little scary. As your baby’s memory improves, you will notice the same reaction to repeated situations. You can help change negative perceptions by distracting your baby and providing positive experiences. Every baby is different and develops at their own pace. Most 9-month-old babies are able to sit (with or without support), clap, crawl, pick up food, etc. You can consult the doctor if you feel your baby has missed a milestone but provide a little more time and stimulation first. 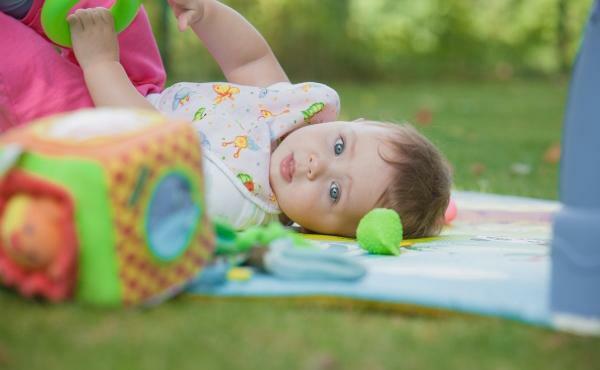 Give your baby plenty of opportunities to crawl and stand, under your supervision of course. Set limits and communicate with different emotions – love, smile, anger, stern voice, etc. Make your time together more productive by reading, walking together, and playing games that allow your baby to explore the environment, and you will find your little one heading towards the first birthday at full speed. This site www.johnsonsbabyarabia.com/en is published by Johnson & Johnson Middle East FZ-LLC, which is solely responsible for the content. It is intended for residents of United Arab Emirates, Saudi Arabia, Kuwait, Lebanon, Jordan, Iraq, Oman, Qatar, Bahrain, Morocco, Egypt, Algeria, Palestine, and Yemen.